I recently made the post here, in which I presented a solution to the problem of returning a value based upon matching a single criterion in a given column across multiple worksheets. In this follow-up post I will look at the analogous case in which we are not matching a single criterion, but several. As mentioned in the first instalment, I will look at two solutions to this problem, one in which we make use of an extra “helper” column in each of the relevant worksheets, and one in which we do without such aids. Most people with an average level of ability in Excel are perfectly capable of using VLOOKUP when this operation is performed over a range within a single worksheet. 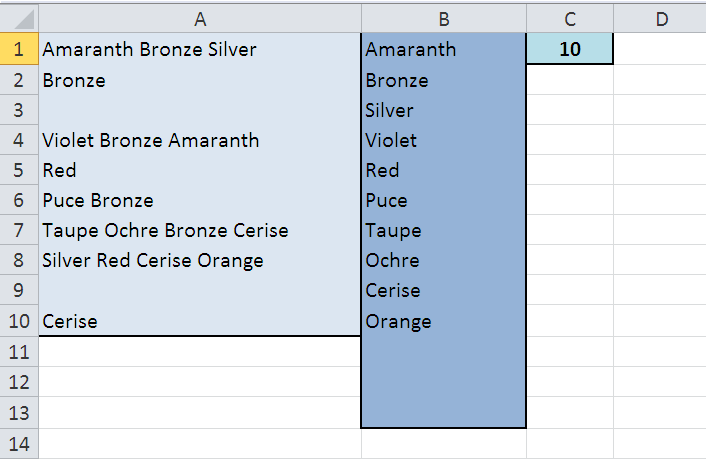 But what happens when we wish to extend our search to multiple worksheets, and so return the first match from whichever sheet happens to be the first which contains our search value(s)? In this post I will present a solution for such cases in which we have a single criterion to be matched in a given column across multiple worksheets. In the next instalment (to follow shortly) I will also look at cases in which we are not matching a single criterion, but several. In this situation by far the simplest method is to use an extra “helper” column in each of the relevant worksheets in which we first perform a concatenation of the fields of interest. By doing this we ensure that it is a relatively straightforward case of extending the solution designed for one criterion to work also with multiple criteria. We usually face no problems in cases where we wish to apply a formula to, not just one, but an array of values. And of course we do this by simply committing the formula as an array formula, i.e. with CSE. However, not all formulas yield so easily, and some stubbornly resist any attempts at coercing an array of returns from them. Here I would like to discuss some techniques which, in addition to array-entry, can help coerce the desired result. The principal method in such cases is to use a construction involving OFFSET, though a set-up using INDEX is equally viable; indeed, due to its non-volatility, perhaps even preferable. Some cases may require even more coercion than that, and others less. But the one thing they all share in common is that, on its own, array-entry just isn’t enough! This one was perhaps a little less complex than ones I’d set in previous weeks, though of course it would still, in my opinion, fall within the boundaries of what I would deem “advanced Excel”. It also demonstrates some techniques which we can apply to solving problems involving non-contiguous ranges, and in particular tell us which functions may be applicable to such set-ups. Two good solutions received from John Jairo V and cyrilbrd (and Bill‘s was practically there as well, but for a small amendment – and the fact that I didn’t structure the question in full to begin with – sorry!). Given the list below in A1:A10, we may wish to create a list of unique, single words from that list, as per column B here. This is a reasonably complex problem, and certainly so if we want to present a solution which is relatively concise. However, despite its complexity (and arguably lack of practical use), the solution demonstrates some important techniques for working with strings, and so is not without merit. This one turns out to be a good deal more complex than it at first appears, and so perhaps not surprisingly no correct results were received..
GreasySpot at first thought that Advanced Filter would be a viable solution, but quickly realised that it wasn’t actually appropriate here. Besides, as I mentioned, the idea of this (and of all these challenges in fact) is to try to achieve the results using worksheet formulas alone. So how can we achieve our desired results? Last week I posed readers the challenge which can be found here. One solution was received, again from Bill, and this time it was not only correct, but a very good solution indeed. So congratulations again to Bill! Last Sunday I set a challenge to readers to come up with a solution to the problem here. Even though this site’s only been up for one week, I’m quite happy to have received the single solution that I did, even more so since that solution was a correct one, from John Jairo Vergara Domìnguez, whose offering you can see if you scroll down to the bottom of that link. Thanks again, John, and well done! As excellent as John’s solution was, it would still require a little tweaking to work for other ranges (part of its construction is dependent on the array in question being in certain columns within the worksheet) and, in any case, I would now like to present the solution that I developed for this problem. We saw in a previous post (here) an outline for a solution which, given a two-dimensional array, potentially containing some empty cells, generated a list of all non-blank entries from that array in a single column. In that solution the returned entries were listed in an order which is consistent with the entries from an entire row from the original array being returned prior to moving onto those in the next row. The converse, in which entries are returned in a columns-first fashion, is the challenge I would like to set for any readers of this post willing to have a go.